One Eternal Day: "Nothing is more compelling than a good man...in an evil time." "Nothing is more compelling than a good man...in an evil time." A long time ago in Germany, a man kept a diary. And some of his words are worth sharing today, because they're a good place to begin our discussion. The man wrote: "Speak both to the powerful and to every man—whoever he may be—appropriately and without affectation. Use plain language. Receive wealth or prosperity without arrogance, and be ready to let it go. Order your life well in every single act. Behave justly to those who are around you. Be vigilant over your thoughts, so that nothing should steal into them without being well examined." He wrote: "Every moment, focus steadily on doing the task at hand with perfect and simple dignity, and with feelings of affection and freedom and justice. Put away hypocrisy. Put away self-love and discontent with your portion in life. We were made for cooperation, and to act against one another is contrary to nature. Accept correction gladly. Teach without anger. Keep yourself simple, good, pure, serious, a friend of justice, kind, affectionate and strenuous in all proper acts." Finally, he wrote: "Take care never to feel toward those who are inhuman, the way they feel toward other men." The dictionary in my home defines wisdom as "the understanding and pursuit of what is true, right or lasting." If that's so, and I believe it is, the words from the diary we just heard are wisdom. They offer us a map to living a worthy life—a life of interior peace flowing out of moral character and purpose. They're as valuable today as when they were first written. But what's interesting is this: They were written more than 1,800 years ago. The author probably didn't intend to see his work published. He wrote mainly for himself—to strengthen his convictions. And many of his thoughts, which we now call the Meditations, were written at war, at night, in winter, from the inside of a Roman military tent, on the German frontier. In his 19 years as emperor, Marcus Aurelius Antoninus had no long period of peace. He spent much of his life away from Rome with the army. He fought one brutal war after another against invaders, and he did it to defend a society that had already lost the values he held dear. Moreover, in the long run he failed. The barbarians won. Rome rotted out and unraveled. His own son Commodus became one of the worst tyrants in history. So why do we remember him? We remember him because nothing is more compelling than a good man in an evil time. 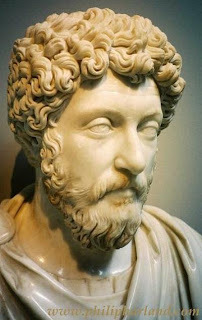 Marcus Aurelius held absolute power in a corrupt age. Yet despite that, he chose to seek what is true and right and lasting; and he disciplined his own life accordingly. In the context of his time, he was a just man and a moral ruler. He achieved that dignity of character by giving his heart first to the pursuit of wisdom, and only then to Rome. He had a brilliant mind, but he had no love of intellect purely for the sake of intellect. Rather, he had a special disgust for intelligence without moral purpose. .... We're fooling ourselves if we think our love affair with science is intellectually chaste, a kind of high-minded romance with knowledge. Chaste it's not. Knowledge is power, and what Americans really love is the power knowledge brings—the power to penetrate, dominate and exploit the natural world. Exactly 70 years ago, C.S. Lewis very shrewdly observed that "There is something which unites magic and applied science while separating both from the wisdom of earlier ages. For the wise men of old, the cardinal problem had been how to conform the soul to reality, and the solution had been knowledge, self-discipline and virtue. [But] for magic and applied science alike, the problem is how to subdue reality to the wishes of men; the solution is a technique; and both, in the practice of this technique, are ready to do things hitherto regarded as [terrible and] impious...."
In his great work, The City of God, St. Augustine created a portrait of the world divided into two cities—the City of God with its eyes set on heaven, and the City of Man rooted in pride and sin. Life consists in choosing one or the other. It’s a choice we can’t avoid. And each of us faces that choice right here, today, now. The wisdom which the Church offers the world is for the humble, not the proud, and it's the only wisdom that counts: the path to salvation. But this salvation is not a philosophy or an ideology, an idea or ideals. No one can “love” an idea, and yet the heart of real wisdom is the ability and willingness to love. Augustine says that all of the wisdom in the Old Testament literally takes on flesh in the New Testament. The reason is simple. Jesus Christ is the Word of God—the Wisdom of God—God as love incarnate. Jesus himself says, "I am the bread of life." He says, "I am the way, the truth, and the life."